Get $20 credit when you drive with GrabHitch! Ever tumpang-ed someone staying nearby to a destination that is on the way? That’s exactly what GrabHitch is, just that you get paid for it! Why not recover some petrol costs while driving, you have empty seats to spare and you are going the same way anyway! We have engineers, lawyers, bankers, and many other interesting people driving to and from work regularly. Any kind of passenger vehicle is eligible for registration, and you don’t need any additional licensing nor documentation! We have sports-cars, coupes, jeeps and many other interesting cars in the community. Drivers choose who to pick up and when to do so according to their own convenience and schedules. Recover up to $140 a week just by doing rides daily! Pick up 8 passengers throughout the week and pay for one full tank of petrol! Recover some driving cost while you travel and help someone who lives and works around you to save on transport cost! Get $20 credit when you sign up as a GrabHitch Driver! It takes less than 5 minutes and can be done straight from your mobile phone. Simply open the GrabHitch tab in the Grab passenger app and fill in your driver details! Your application will be approved in 1-2 business days. You will be notified and can start driving upon approval! “My passenger is an expat and I learnt more about her home country and her experiences working abroad” – Benjamin K.
“Picked up same passenger for fourth time and she decided to use my vehicle number to buy 4D!” – Keong T. S.
“On the way to pick kids in the band, get a hitch of band teacher.” – Kerry C.
“I can now share childcare tips with a fellow mother who lives near me!” – Grace W.
“My GrabHitch buddy is 10 years younger, went to the same schools, and even had the same teachers!” – Kristine W.
“We both love football and had debates and shared secrets on our Fantasy Football teams!” – Alexander L.
“I made someone’s day by picking her up as it helped to save her some cash. She was very grateful after.” – Stanwin S.
“Got to know a fellow colleagues working for the same company, from a different department (working two blocks away)!” – Jonathan T.
“I love that I get to meet people who live around my neighbourhood, my GrabHitch kaki is now my tennis buddy!” – Elwin B. “Once hitched a dentist who explained the dynamics of tooth extraction – interesting!” – Terence N.
For existing GrabHitch drivers, thank you for continuously showing your support for our social ride sharing platform. Share the love and spread the joy and get $20 for every additional driver you refer to GrabHitch! This incentive is only eligible for new drivers who sign up and successfully complete 1 Hitch ride as a driver between 1st April 2017 @ 00:00 hours – 31st May 2017 @ 12:00 hours. New drivers must sign up with the referral code HITCHSG in order to qualify for the $20 credit incentive. The processing of the $20 credit incentive will only be conducted after the incentive period has ended (post-31st May 2017). Please allow up to 10 working days for the crediting of the $20 incentive into Hitch driver wallets. 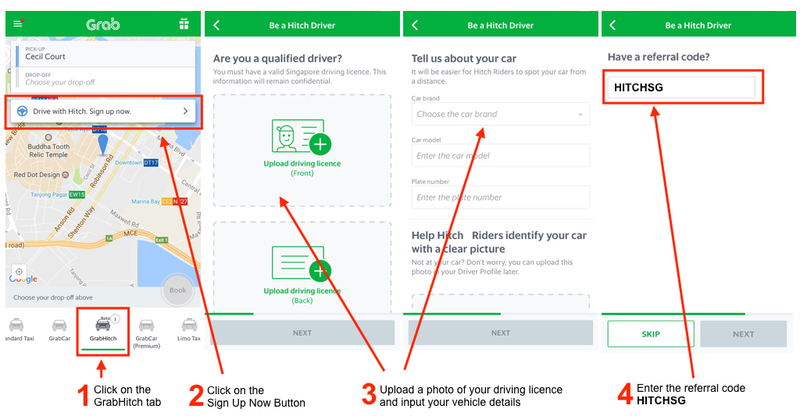 If you’re still not sure how to sign up, or have any questions regarding GrabHitch, email us at grabhitch@grab.com with the Subject: HITCHSG and we will get back to you in 1-3 working days.